The first three months of the new fiscal have seen kitchen costs surging mainly on account of rise in vegetable prices. 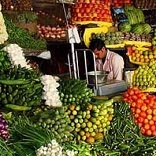 NEW DELHI: The first three months of the new fiscal have seen kitchen costs surging mainly on account of rise in vegetable prices, according to an Assocham study. The study of 33 markets across the country observed that on an average, retailers are selling vegetables at more than 48.8 per cent of wholesale prices. "The analysis is based on the wholesale and retail prices of vegetables in the different markets in India. Wholesale price indicates the price at which retailers are buying from different markets and retail price is the price at which consumers are buying from retailers," Assocham Secretary General D S Rawat said. The study found that cabbage retail and wholesale price gap has increased from 69.4 per cent to 78.1 per cent, brinjal from 62.4 per cent to 66.7 per cent while cauliflower is 59 per cent higher than the wholesale price, among other vegetables. It further reveals that Surat retail and wholesale price gap has increased from 49.7 per cent to 50.8 per cent, Lucknow 48.5 per cent to 54.8 per cent, Shimla 37.9 per cent to 47.3 per cent, Jammu 37.5 per cent to 42.4 per cent and Chennai 34.6 per cent to 37.3 per cent, among other cities. The study observed that onion arrival grew at a rate of 13 per cent during 2013-14 followed by tomato which grew at a rate of 7.9 per cent and potato fresh arrival grew at a rate of 6.2 per cent. Ladyfinger and Cauliflower arrivals have recorded marginal growth rate of 0.4 per cent and 1.9 per cent during the same period, mentioned the study. Meanwhile, a study conducted by PHD Chamber of Commerce found that deficient South-West monsoon may hit kharif crops yield and stoke food inflation. It further observed that the increase in input costs may impact farmers' earnings and the demand for goods and services. According to the study, the cumulative rainfall for the period between June 1 and July 4 for the country has recorded a deficit of 43 per cent. India's leading foodgrain producing states include Uttar Pradesh, Punjab, Madhya Pradesh, Rajasthan, Andhra Pradesh, West Bengal, Haryana, Bihar, Karnataka and Maharashtra contributed around 82 per cent in India's total foodgrain production in FY'2013. While India's leading commercial crops producing states such as Uttar Pradesh, Maharashtra, Karnataka, Tamil Nadu, Andhra Pradesh, Bihar, Madhya Pradesh, Haryana and West Bengal contributed around 87 per cent in India's commercial crops production during the same period.